Pink winter has set in. Temperatures are going up some notches higher and showing mercy. The wedding season has kicked in. Preparations are in full swing for all the customary rituals and ceremonies. The weather is just apt to dress up in all the bridal finery. You are about to tie the knot and your big day is fast approaching. The Indian wedding is all about its elaborate lavish functions. And even you have planned quite a few. 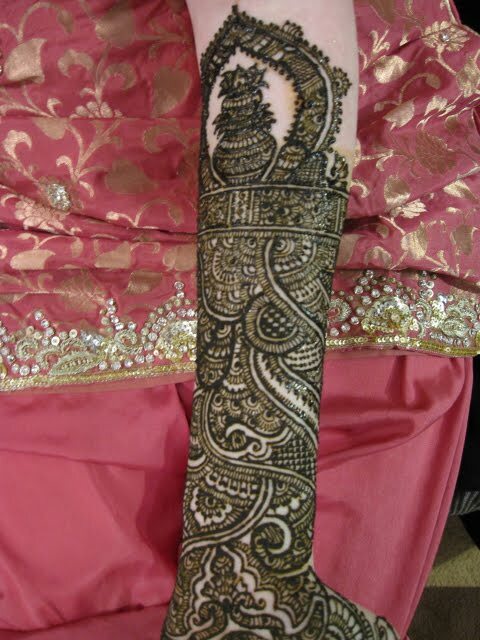 One of the favorite amongst them is the mehendi function. 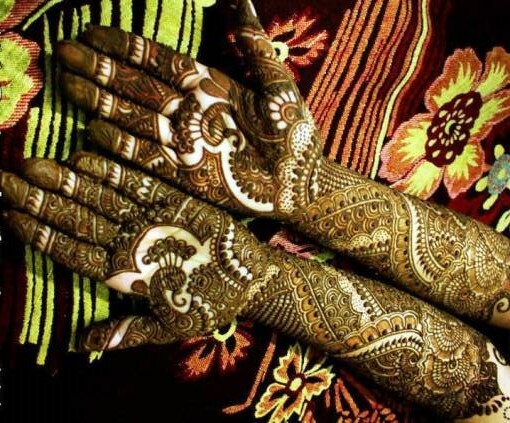 Almost all Indian women are fond of decorating their hands with mehendi, and when it is for one’s own wedding, then the charm is manifold. When it comes to designs, you can be really spoilt for choices. You can choose from the detailed intricate Indian style mehendi art or opt for a fusion of Indo-Pakistani or Indo-Arabic designs. The Indian art form has a wide variety to choose from. Every region in India has its own unique style for brides. Intricate, detailed and extremely fine, the hands and feet look beautiful after the mehendi is applied. It adds to the entire look of the bride. In Rajasthani art, the main motifs include peacocks, flowers and mango leaves, decorated elephants and a Rajasthani prince and princess representing the groom and the bride respectively. The Marwari designs are just an extension of the Rajasthani designs, but they also include Radha-Krisha motifs and king and queen motifs in an interesting manner. Its neighboring state Punjab has equally ornate designs. Here too almost the same motifs are used, but when it comes to bridal mehendi, each design tells a story. The South Indian style borrows a lot from Arabic designs and can be called a blend of Indian and Arabic designs. Earlier the under part of the foot was just smeared with mehendi to get the color, but nowadays, patterns are drawn down there for a very unique look. Many brides even go for designs that match with the motifs on their bridal outfit. 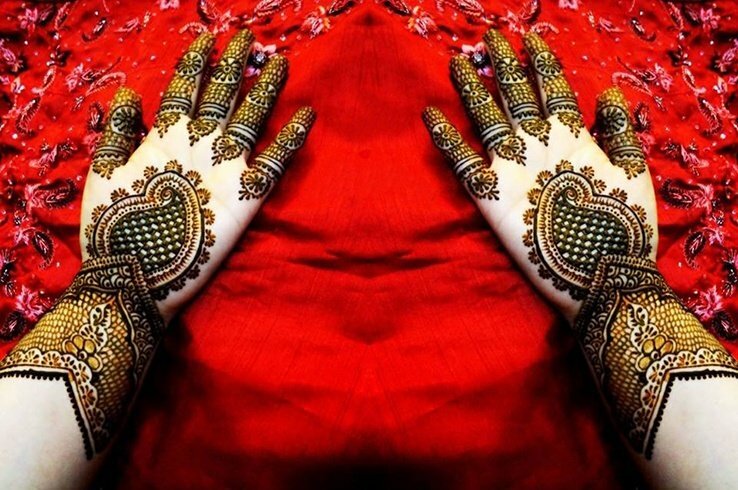 The fun part of bridal mehendi is the initials of the groom that is hidden in the bride’s hand. There is a ceremony where the groom along with his friends comes and looks for the hidden character of his initials in the bride’s hands. It is a fun-filled ceremony where the groom gets a gift if he succeeds in figuring out his name. 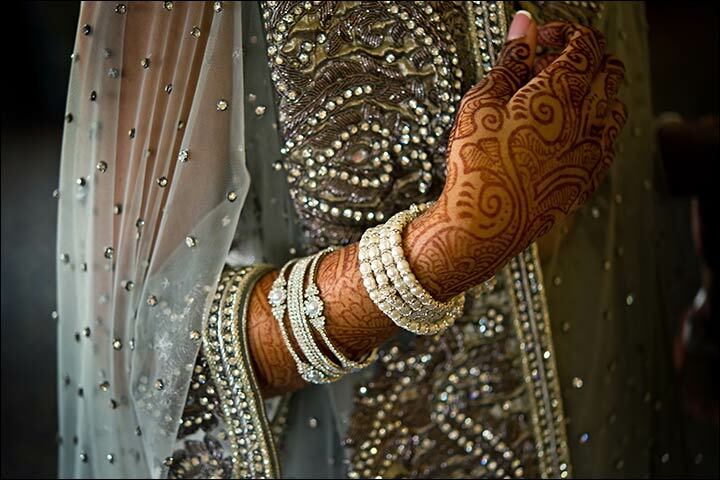 Many brides even get the alphabets of the full name written, scattered all over her hand. 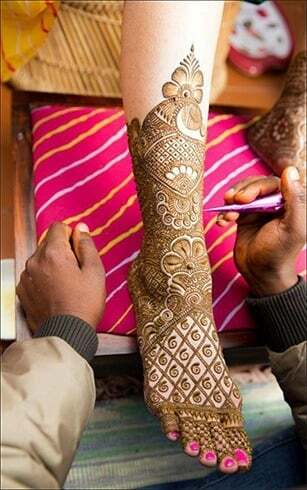 In some Indian communities, it is also customary for the bride’s sister to go and apply mehendi on the groom’s hand. She in turn gets a gift mostly monetary that is shared amongst all the sisters.